From its attractive views of Pikes Peak and the Front Range to rolling hills, recreation parks and trails, and history of agriculture. Fountain boasts the charming aspects of country living with the urban amenities of great restaurants and stores. Located along I-25 and Fountain Creek, Fountain retains a friendly small town atmosphere and quick access to Colorado Springs. Can trace its roots to the Ute Indians choosing the confluence of Jimmy Camp Creek and Fountain Creek as wintering grounds. Rich with game, trappers followed setting up trading posts along the Fountaine Qui Bouille or "bubbling springs." There are many stories about Jimmy's Camp, a trading post said to connect the forts on the plains to forts on the front range of the Rockies. Some say Jimmy was an Irishman, some say a soldier, and others say a trader. His camp laid along the creek on "Trappers Trail," Cherokee Trail," or "Jimmy's Camp Trail," depending on whose version is told. All agree Jimmy was killed in his camp around 1842. Every tale tells a different version of "who dun it!" Fountain is said to have had a Pony Express stop at one of its first houses, which doubled as a post office. Mail later came by rail. 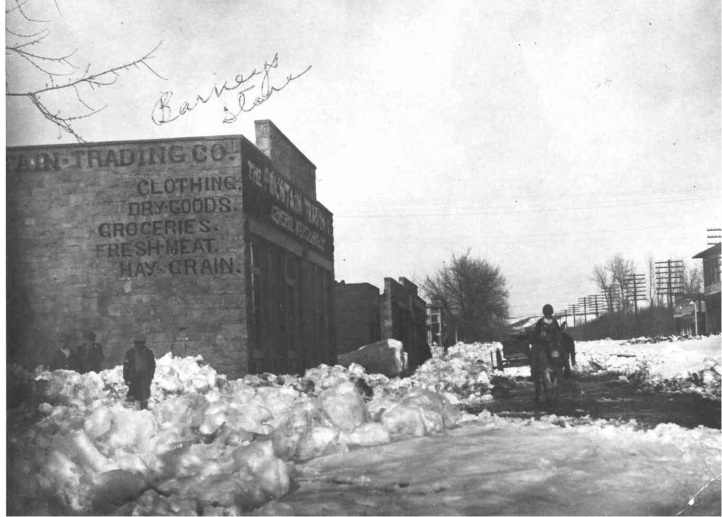 The post office moved to Barney's Food Market on Main Street in 1926. The first post office in El Paso County was in Fountain Valley. Fountain's post office remains the oldest one in the County. A stage coach road connected Canyon City and Denver in 1873. The Colorado gold rush increased its patronage. Coaches ran day and night, stopping only to switch horses or allow buffalo herds to pass...our first traffic jams! Stage coaches eventually gave way to rail. Settlers arrived in covered wagons, farms sprung up and soon the valley was alive with cattle, dairies and merchants. The main crops were sugar beets, cherries, beans, grain, corn and alfalfa. In 1919 the town was still surrounded by farms, and the irrigation ditches still flow to today. In 1898 the Fountain Trading Company was established and still stands today at 117 Main Street. 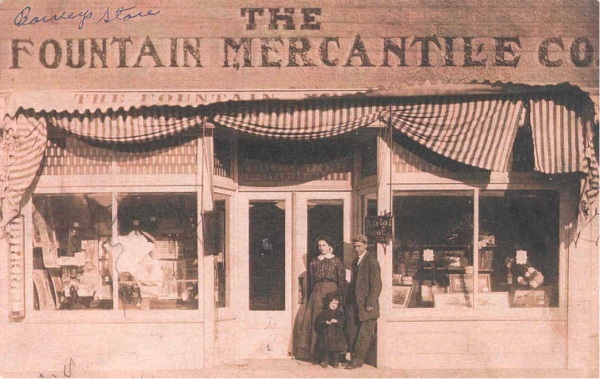 This mercantile store provided supplies to miners, traders, ranchers, trappers and farmers. The oldest church in El Paso County is just two blocks north. The town of Fountain was founded in 1859, the same year as Colorado City, Denver, Golden and Central City. It was built with the idea it would some day be the biggest city in the state, possibly the state capitol. Even then the town had big ideas! But the big idea went up in smoke, quite literally, in 1888 when a train broke loose in Colorado Springs, gained speed approaching Fountain and slammed into a rail car. The fire spread to a car full of explosives. The blast was felt 13 miles north in Colorado Springs. Residents of Monument, 33 miles to the north, reported it woke almost everyone in town! Fountain rebuilt itself and was incorporated as a town in 1903. It remains one of the oldest incorporated towns in the Pikes Peak region. By 1942 the war had arrived, and Fountain had a new neighbor. Named after Kit Carson, Fort Carson was founded in 1942 and has played a major role in the community. Between 1942 and 1956, trains of up to 300 mules were a common sight to carry equipment, weapons and supplies over mountainous terrain. For 13 years, the mule Hambone carried supplies for Fort Carson and was buried with full military honors. Today "the Mountain Post" has over 25,000 soldiers. In 2002, Fountain was one of 10 cities to receive recognition as an “All-America” City in Kansas City, Missouri, from the Denver-based National Civic League. The awards competition recognizes communities for citizen involvement and civic excellence. In 2002 Fountain had just over 15,000 residents and was Colorado’s 10th community to receive the award since it was created in 1949. Approximately 45 representatives of Fountain attended the ceremony. Developing a community center: Fountain utilized an abandoned school to open the Lorraine Education and Community Center, with more than 16 non-profit organizations collaborating to provide community services. Planning the future of the city from land use to recreational to environmental needs: the City developed two new “greenfrastructure” parks: Hibbard Park and John Lindamood Park; built a new municipal complex and plaza as well as completed $1+ million in streetscape - sidewalks, parking and landscaped medians. Improving School District 8’s performance, including higher test scores and a 98 percent high school graduation rate: Fountain improved national test scores; achieved 95% district-wide attendance rate, 93.4% graduation rate with a 92.5% minority graduation rate. How were these achievements accomplished? A challenge was posed to City Council to develop a series of plans and activities, beginning with the City comprehensive plan -- and including the contributions of schools, businesses, residents, youth and its non-profit community -- to effectively manage urban population growth and economic development, while providing and maintaining a high quality of services to enhance its citizens’ lifestyles and the Fountain Valley community’s image. State Office of Historic Preservation. Located at the corner of Main Street and Iowa in downtown Fountain. Staffed by local volunteers, its hours are Fridays and Saturdays: 1 to 4 p.m. Fridays and 10 a.m. to 4 p.m. on Saturdays. Call 719-322-2005 for tours. Opened on December 6, 2003. The museum has a variety of historical displays such as the history of the beginning in Fountain Valley as well as stories from and about the early settlers. Other collections include the history on the schools, an organ from the Julie Penrose home, an original stage curtain, first fire hose wagon, and many articles on the train explosion. Was formed in 2012 as a result of vandalism and destruction of headstones and other artifacts at the cemetery located at 757 South Santa Fe Avenue. Concerned volunteers formed the Society to optimize the cemetery’s potential as a cultural resource through education, preservation, protection and promotion of Fountain Fairview Cemetery’s unique heritage, including tours and special events to raise funds for repairs and a security system for the cemetery. Membership is free and open to any adult member of a family who has family members, friends, associates or loved ones buried in the Fountain Fairview Cemetery, or anyone who has an interest in furthering the purpose and objectives of the Society. The Society is a 501c3 not-for-profit organization and holds fun and educational annual events like headstone/marker preservation classes, Cemetery Historical Tours, Lantern Historical Tours, History Scavenger Hunts, and Cemetery Clean-up Days. For more information, please email fffc1871@gmail.com, or contact us at Fountain City Hall, 719-322-2021. Has a Fountain branch located at 230 S. Main Street, one block south of City Hall. Is honored to serve two uniquely diverse communities with eight schools in the City of Fountain and five schools located on the Fort Carson U.S. Army military post. The school district has a student population of approximately 8,000. Schools in District 8 excel at serving a wide variety of student needs with over 60% of the population being military-connected and 16% designated as having special needs. District 8 strives to serve students and staff through a focused effort on increased access to technology with their 1-to-1 laptop initiative at Fountain-Fort Carson High School and the new (for 2017-18 school year) 1-to-1 initiative for seventh and eighth grade students at both Fountain and Carson Middle schools. District 8 is also dedicated to physical facilities that provide exceptional learning and working environments for students and staff. The district is constructing a new building for Fountain Middle School that is set to open in the fall of 2018. The district employs approximately 1,000 teachers, certified, classified and administrative staff. District 8 is committed to hiring and retaining the best staff by providing competitively high wages and benefits. For more info please visit us online. Is a vibrant community tucked away in southeast Colorado Springs. We are proud neighbors with Fort Carson, and we strongly support our military families. Our climate and culture gives a comforting small-town feel in a big-city environment. Widefield offers a wide variety of programs, including everything from music and art to engineering and manufacturing. We're also the only school district to own a parks and recreation center. Widefield is a place you come to learn, live and play. Believe in Widefield! For more info please visit us online.